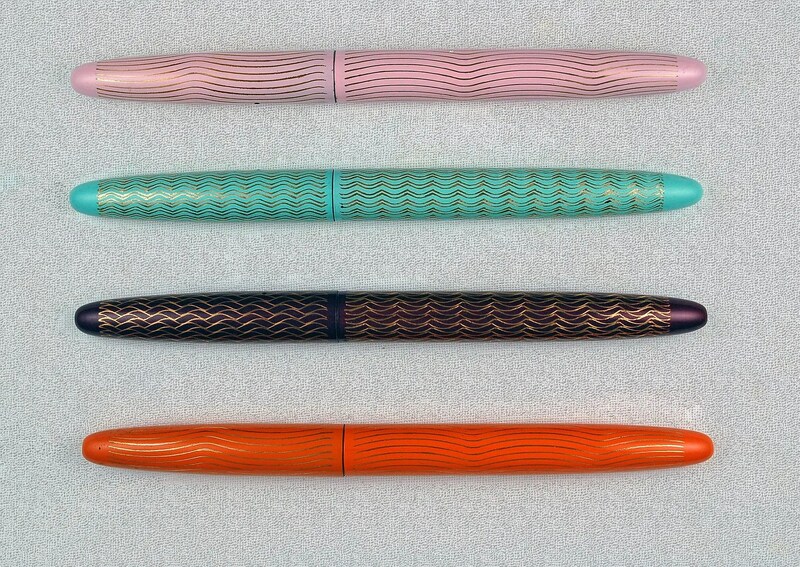 For those of you who have followed this blog since it started eight years ago, you will know that one of my favorite topics is George Kraker and his colorful career in the fountain pen business in the 1920s. Just click on his name in the Blogroll to the right and there are many posts regarding his pens in Minneapolis, Chicago, Kansas City, Grand Haven (MI) and Libertyville (IL). One pen of his that has always eluded me is his bi-color, Libertyville produced, Flat Top lever filler. The are not extremely rare, but seem to get snapped up quickly if they hit the market. Speculation is that these were produced and marketed for the School market. They come in several color variations and the thought is that they targeted various educational institutions and their school colors. This would have targeted black and gold schools. Coincidentally, my oldest daughter is a current college student at a Black and Gold University and this will be an easy one to pass along. I have another in college – did Kraker make an orange and blue? 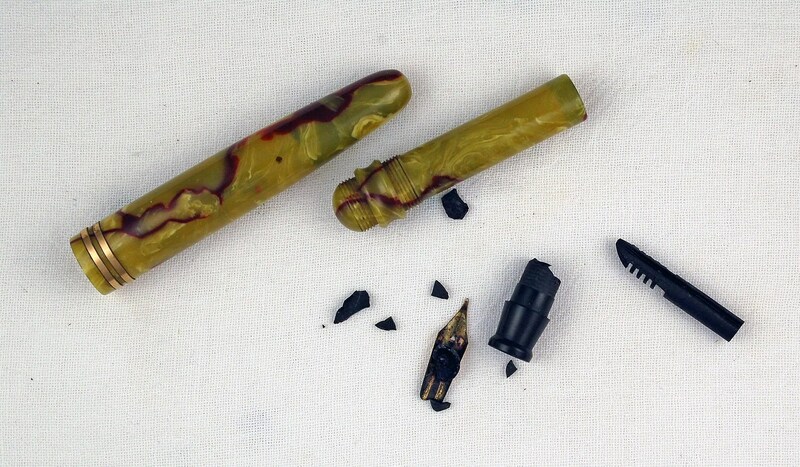 Below is the pen after I took it apart. Like all of his brands of the period (late 1920s), these were solid lever fillers. I spent quite a bit of this restoration, as one does with light colored pens (white, yellow etc..) cleaning the body and threads. For the threads, I have been using a toothbrush and ink remover. It seems to work very well, as you can see from the photo below. I also cleaned the section and feed with gentle water and qtips, and made sure to clean the grooves in the feed with an x-acto knife. The nib (photo below) is a nice Forever No. 3, common in many later model Kraker products. It polished up nicely and the fit was perfect when inserted back in the barrel. This one took a shortened size 16 sac. The completed pen measures 4 1/4 inches closed and 5 3/4 inches posted. Here is a close up of the crisp imprint. As a refresher, George Kraker used his first and middle names reversed as the name of his pen company when he was in Illinois and Michigan. His full name was George Michael Kraker – thus the Michael-George Company name. Also, Libertyville was his last stop as a major pen maker. Here is a close up of the Forever No. 3 nib. His various models of the period – Dixie, Yankee, Pencraft, Monogram, Minnesota, and a few others – had many different nibs – Warranted, Yankee, Dixie, Everlasting, and Forever (similar to this one). Finally, this pen seems to be built on the same platform that he used for many of his other pens which can all be accessed from the menu on the right. Go Black and Gold!! Way back in May of 2011, I wrote about Sheaffer Lady Skripsert Pens. They are an interesting collectible, easy to clean, restore, use, and it is easy enough to find some of the common variations and patterns. Well, as has been the case since fountain pens came into existence, once a style of pen becomes popular, you can count on someone else to duplicate it. This is the case of the Sheaffer Skripsert. 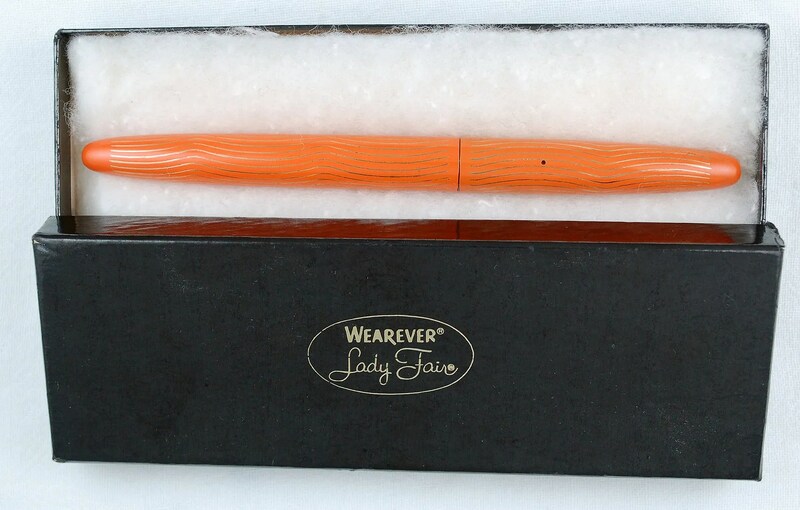 At some point Wearever Pens produced a very similar model called the Lady Fair. Very feminine sounding and clearly directed at the female pen user, as was the Skripsert. I have come across four examples in orange, pink, maroon, and light blue-green. The orange pen, comes in a nice presentation box as well. Apparently there were also sets. Here is the pink version with a matching pencil. Here is a close up of the steel nib. Nothing to write home about, but Wearever was never focused on high end pens, simply on mass produced, affordable pens. I do like the clear feed which appears on all of these. As with the Sheaffer Skripsert pens, these are cartridge filled, using the proprietary Wearever cartridges. 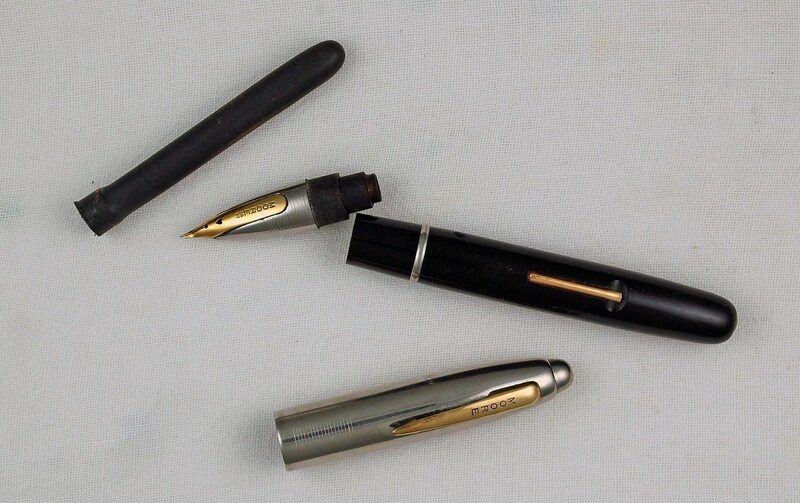 Here are two Wearevers surrounding a Sheaffer. Note the similarities. Here are two links to December 1958 advertisements from a department store in Milwaukee, Wisconsin showing that these retailed for$1.95 at the time and that they came in the five colors shown above – Plum, Black, Harvest, Aqua, and Shell Pink. and a few weeks later, the same newspaper and department store advertises (on Christmas Eve) the pens using different, and simpler, names for the colors – Black, Gold, Wine, Pink and Green. 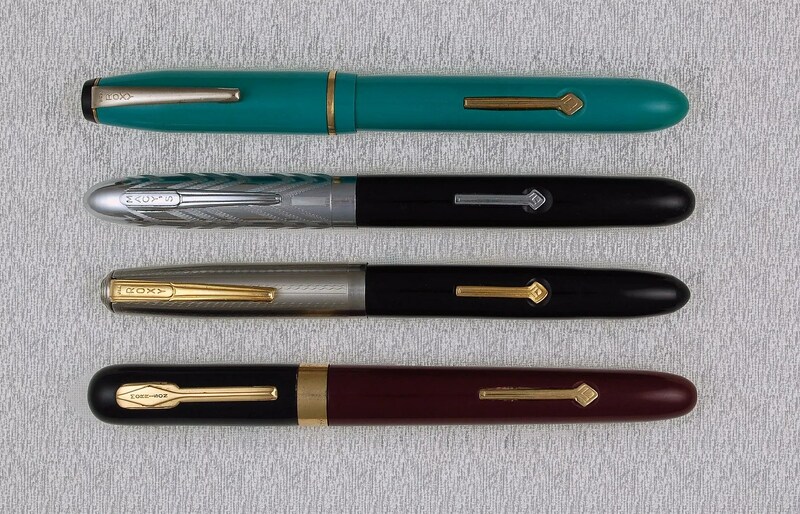 As with most Wearevers, not the highest quality, and built to fit a lower price point, these Lady Fairs present a small and unique corner of the fountain pen hobby. I recently received a very nice long short pen from Pen Maker Darrell Eisner, from Nova Scotia. It is shown here both open and closed. It is a cartridge filler and made of solid metal. I have been carrying it in my pocket due to its durability. After receiving it and putting it to use, it reminded me that I have a couple of vintage long short models that need restoration and have been sitting on the workbench for far too long. First, here are some photos of Darrell Eisner’s pen. Below are the two vintage long short pens in need of restoration. The top group is an unbranded black bulb filler and the second narrative is a Diamond Point, a brand known by many collectors. As you can see, the unbranded bulb filler has a transparent barrel which had discolored quite a bit. The Diamond Point had a hardened sac as well, and the usual nib – section – feed stains. I made the decision to leave the bulb filler’s section alone. Separating the section/feed/nib from the barrel would have probably damaged the transparent barrel and I did not want to risk this. So I just ran the whole piece through the ultrasonic cleaner and left well enough alone. 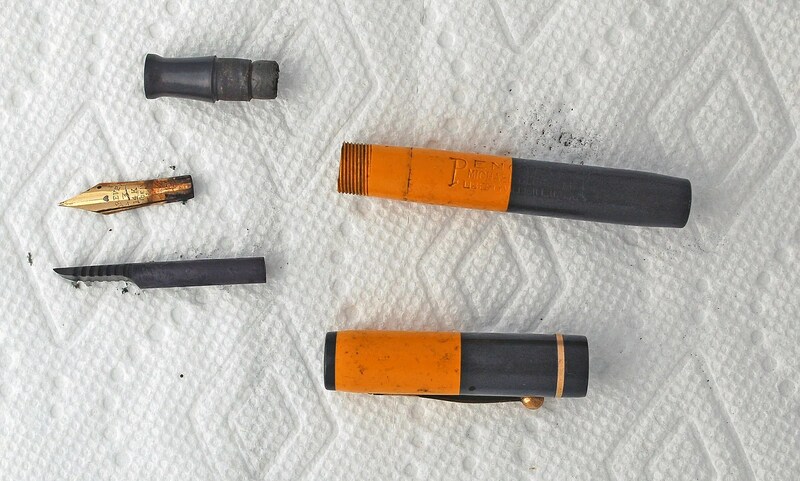 The breather tube was fortunately still in good shape and water tests showed that there was no leaking from the barrel, which did clear up a bit after cleaning. I used a size 14 sac, trimmed to exactly one inch to complete the bulb filler by using sac cement to anchor it to the barrel, just below the clear threads. I then placed silicon grease on the clear threads to assure a smooth fit. After finishing this, I cleaned out the inside of the cap and barrel end. Finally, I tested the pen by filling with water overnight and testing for leaks. None were found and it is ready to go. Directly below is a close up of the completed filling system. To fill, squeeze the sac (bulb) while the nib is submerged in your ink of choice. The second pen, a Diamond Point is shown below after being taken apart. It is a standard lever filler, and these can be found in various colors. You can see that it is a simple lever filler that has lost its sac and has severe staining issues. I cleaned the 14K nib in the ultrasonic cleaner and it is a very nice Warranted 5 nib. I trimmed up a size 14 sac to about 1 inch and cemented it to the section. You can see the resulting filling system below. The small lever was still in great shape, and the barrel and cap needed little cleaning other than some polishing. Here are both pens completed and ready to write. The Bulb Filler measures 3 11/16 inches close and 5 7/16 inches posted. The Diamond Point measures 3 13/32 inches closes and 5 11/16 inches posted. This photo shows how the Diamond Point cap screws onto the cap the second set of barrel threads when posting. Just for fun, and comparison, below are photos of a few additional long short pens. There are many more, but here are a few that I could find in my collection. 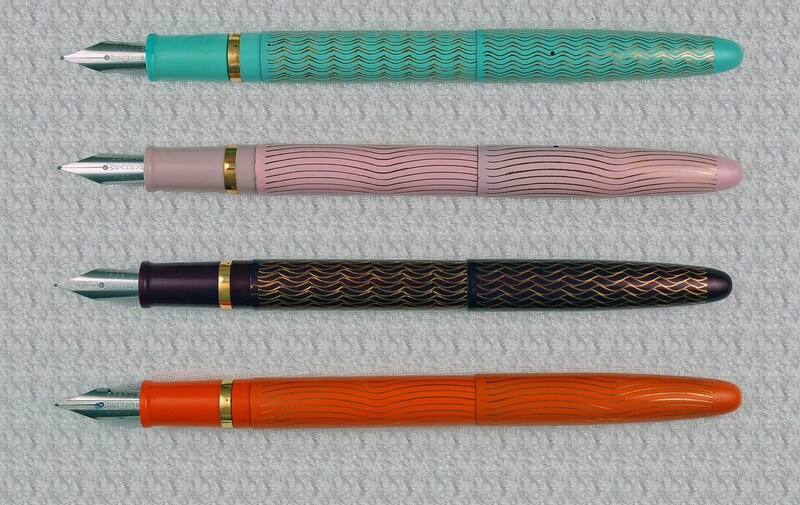 The Bexley Long Short – a cartridge filler that come in many colorful variations and is solidly made. A previously restored c1941 Sheaffer Vacuum-Fil Tuckaway. Note the threads on the back of the cap again, similar to the Diamond Point and Bexley. And finally, a contemporary Pilot (Japan) Elite Fountain Pen. Pilot has made numerous long short pens throughout their history. This is a current model. 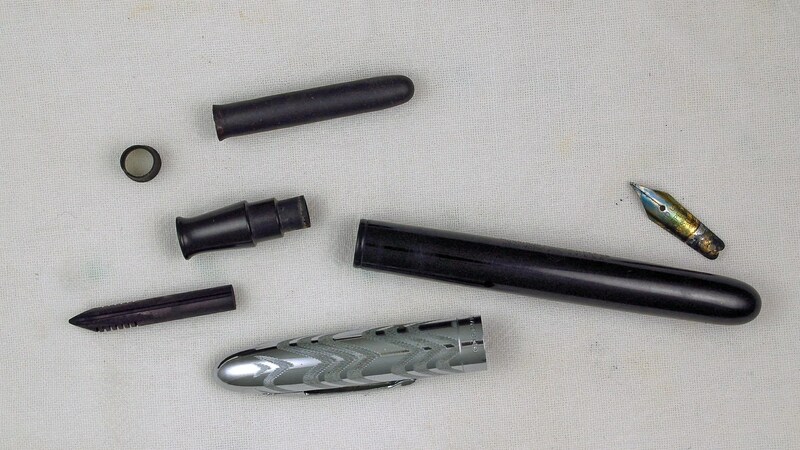 The Fingertip was one of Moore’s final Fountain Pen Products, produced in the late 1940s. The first post above covers the standard Fingertip model and the second two cover a variation, which I call the second generation, but is simply a variant of the first with a metal cap. The third post focuses on a smaller size of the metal capped variant. This restoration is of a Pen and Pencil set of the smaller variant metal capped Moore Fingertip. As you can see below, the pen is pretty clean and just needs a new sac. These smaller Fingertips take a size 14 sac and the small barrel size makes for a very short cut and not a lot of ink. I cleaned the section/nib in the ultrasonic cleaner and attached a new sac, trimming it to the correct barrel length. Remember that the sections on Fingertips are friction fit. After polishing, here is the resulting set, in black with silver and gold cap. The pencil is actually very well made and cap actuated, clutch style, and takes 0.9 mm lead. The pen is 4 9/16 inches closed and 5 1/2 inches posted. The pencil is a short 4 1/2 inches. And finally, the Presentation Box for this small, but attractive set. As you may have noticed, I have a soft spot for the Fingertip. I have recently come across a few different colors that are in pretty rough shape and will get to their restoration soon! On January 6th of this year, I wrote about the restoration of a burgundy Webster Skyrocket Fountain Pen. A week or so ago, I came upon a similar pen, but a ballpoint. As it was the same burgundy color, I snatched it up and worked to produce a nice set. Below, you can see the pen after I took it apart. Ballpoints are fairly simple, just the cap, barrel, section, and ornamental ring, and the refill. However, as with all vintage ballpoints, the refill is long from being functional. If you have looked at enough of these old ballpoints, you can start to note which current refills will work and this one looked similar to a Cross refill. I have used these Cross / Penatia refills before in the restoration of my collection of Eversharp Kimberly Pens, and have a supply on hand. I measured one next to the original refill and crimped the end of the Penatia by about one quarter inch, after removing the black plastic end piece. The only remaining problem was that the original refill was a tad bit thicker as it sat in the section. I solved this by gluing a small piece of sac to the end of the new refill and it sits perfectly in the section now. Below are photos of newly restored Skyrocket set, both closed and posted. You can see that the design of the ballpoint makes it’s cap longer, though the barrels are the same size. The ballpoint is an interesting addition, and is actually very comfortable to write with if you like a larger pen. 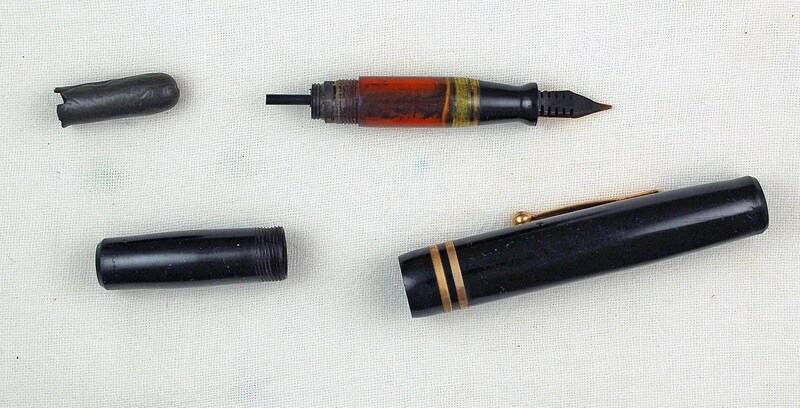 One of the fun things about restoring and collecting pens is the subsets that some fall into. 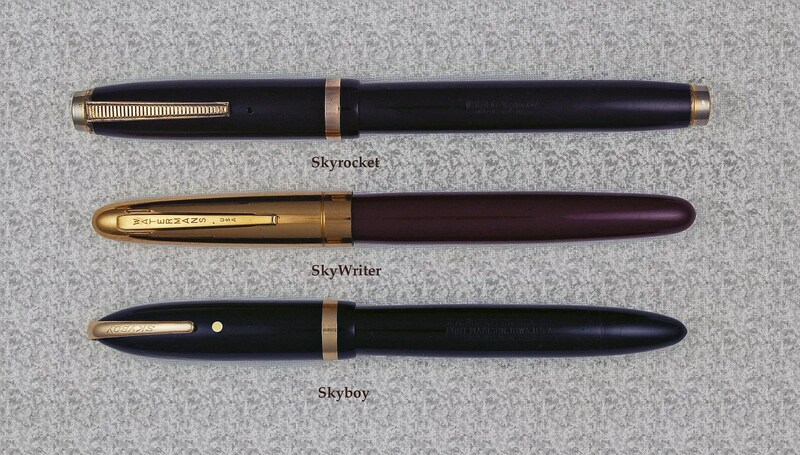 In my last post, the Webster Skyrocket fell into interesting categories of Webster Pens, Sears Pens, and Pens that capitalized on the surge and excitement of Air Travel. This restoration is similar. The pen is a recently found Macy’s Pen. Both its lineage and genre are interesting. First the pen..
As you can see below, it was lightly used in its day. The plated nib is ink stained and the sac is hard, though still in one piece. The exterior of the pen is spotless, making for an easy restoration. I cleaned the nib and feed in the ultrasonic cleaner. I left the section to be cleaned by simple swipes with a q-tip and water. Eventually the section and feed were completely cleaned. The problem was the nib. As you can see above, much of the plating of the “Iridium Tipped USA” nib (more on these below) had already worn off from a combination of time and ink. Gentle ultrasonic cleaning just highlighted the washed out cheap finish. So, I searched for a replacement and found a perfect fit. I had a steel Parkette fine nib in my parts bin and it fit the feed and section perfectly. Combined with the silver cap and lever, it makes a decent pairing. Below is the completed project, a nice Macy’s branded pen from probably the 1940s or 1950s. The pen measures 5 7/32 inches closed and 6 3/8 inches posted with the Parkette nib. The Manufacturer on the barrel of the pen is the Morrison Fountain Pen Company. Morrison Fountain Pen Company, and some of its sub brands can be found dating back into the 1920s. This Macy’s pen is a much later example. I would surmise that this pen dates to the late 40s or 50s, towards the end of Morrison Company Fountain Pens. I have also restored a few Morrison brands that date from the same time period, and they are photographed below. Two are Roxy’s and on is a Morrison. All have steel nibs similar to the original (replaced) nib on the Macy’s pen. 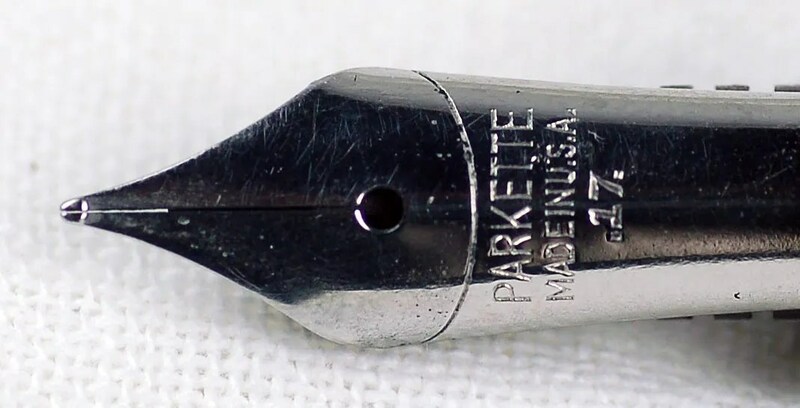 Here is a close up of the Parkette nib used as a replacement. It’s silver color fits well with the cap and lever and is commensurate in quality with the “Iridium Tipped USA” nib that was damaged and discolored. 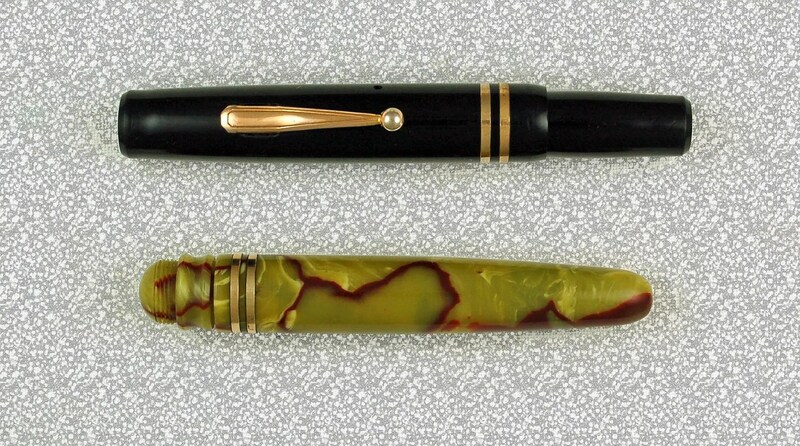 The photo below is of the Macy’s pen and a Morrison Ballpoint that I recently restored and use with a new refill. While not a perfect match, it makes a nice set. The second collecting subset that this pen falls into, as alluded to in the first paragraph above, is the Retail Store Branded pen group. My suspicion is that this was a pen sold at R. H. Macy’s, produced by Morrison, and available to the general public. Macy’s has a long history of having quality pens produced for them by Fountain Pen Companies bearing their name. Other Store branded pens that I have restored and written about in the past are the Filene’s and Buettell Brothers pens. These were of lesser quality, ring tops, and earlier models. My guess is that they were used by employees and not sale items, though again I have no written proof. If anyone has any evidence, I would love to hear. These pens, such as the Macy’s do show up from time to time. In this case, they appeal to both the collector of Morrison Pens and Store Named Pens. An excellent summary of R. H. Macy Pens has been written by Richard Binder and should be read here. Whether these areas of focus appeal to the collector, or not, this is a nice user pen, representing the later stages of Fountain Pen production and usage. 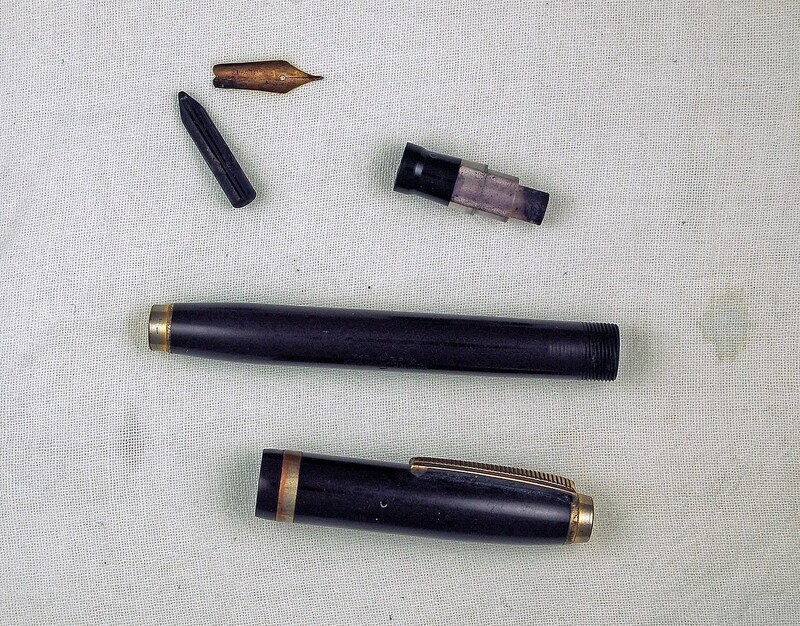 Edit: After completing this restoration and the writing of the above, I obtained a Roxy Fountain Pen (Morrison), that was identical to this Macy’s Pen except for the clip imprint. Below are before and after photos of its subsequent restoration and a photo next to the Macy’s Pen. An interesting example of rebranding by Morrison to bring in some additional income. Edit: Oddly enough, as I finished restoring the Roxy, a third pen arrived, a Morrison. I won’t go through the restoration, but though not identical to the Roxy and Macy’s pens, it is close. My guess is that it is from about the same time, but is an attempt by Morrison to imitate some of the popular hooded pens such as the Waterman Taperites and Parker 51s. Note the same barrel, lever, imprint, similar cap, but section that contains a hooded nib, and a shorter length. Finally, below are all three together. Interesting look into later Morrison products, and some of their last fountain pen models. Webster Pens, best known for being a Sears brand, were produced by several manufacturers throughout the years. These pens were sold both through catalogs and in Stores for years. An early Black Hard Rubber example appeared here way back in December of 2007 (Store Pens) and again in March of 2008 (Webster Pens). Much later, perhaps in the late 1940s or early 50s, this Webster Skyrocket appeared on the scene. Below you can see the restoration. It is a simple lever filler, with a nice visible ink window. I found this one lightly used and a thorough cleaning in the ultrasonic cleaner (section, feed, and nib) revealed a healthy dose of left over black ink. The sac was nothing more than powder, but the lever was intact. After cleaning the feed, nib (14K Webster) and section, I proceeded to polish up the cap and barrel. As you can see from the photo above, much of the cheap gold plating has worn off of the cap end, band and barrel end. However the clip and lever have retained their gold. I attempted to clean the rest of the pen’s plastic, while leaving all of the plating in it’s original, imperfect condition. I replaced the old sac with a size 16 clear sac to provide for a nice look through the section window when filled with ink. After the sac was attached, I let it sit overnight and tested with water for any possible leaks. The resulting pen is below. The Pen measures 5 5/16 closed and a very long 6 3/8 inches posted and was probably produced by National Pen Products of Chicago for Sears. It is a burgundy, or I have seen it described as Dubonnet Red in other Webster models. I have also seen it in black, and a Ballpoint pen, similar in design, can be found. This pen is quite heavy in relation to many of its contemporaries and as previously mentions measures a long 5 5/16 inches capped and 6 3/8 inches posted. Much attention to Webster Fountain Pens is directed to the earlier models and the Parker produced models, but for a user pen, this one shouldn’t be overlooked. 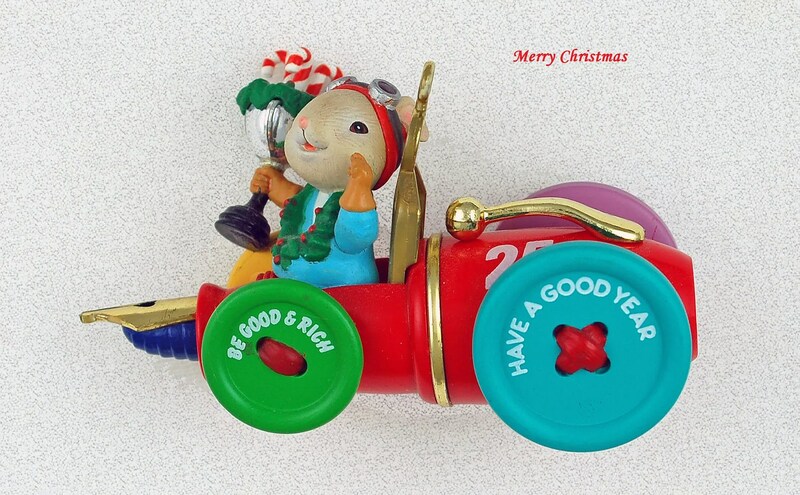 Merry Christmas from Fountain Pen Restoration! 2014 has been a slow year at the old workbench. It’s not for lack of projects, which are piling up as I write this. Some times, however, family and job do take priority status. I have been cataloging projects for 2015 and look to get started shortly with repairs, photos, and research. 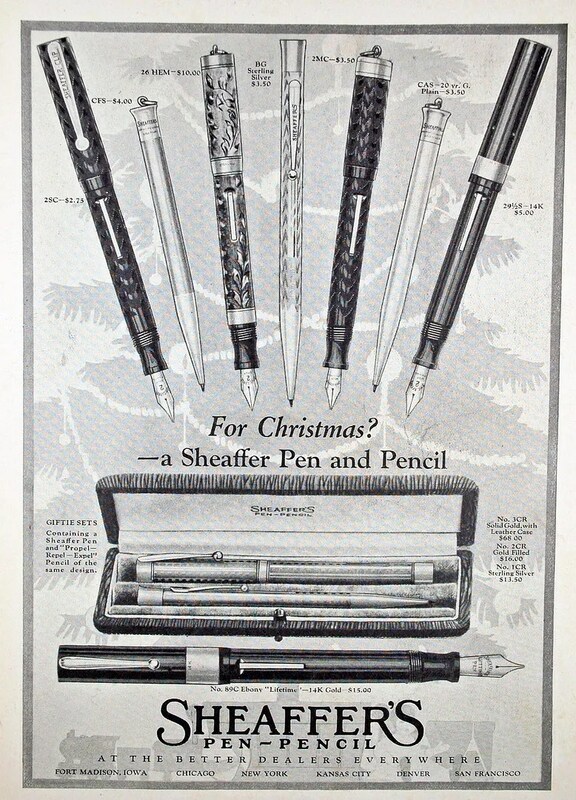 In the past seven years, my Christmas post has often shared a photo of vintage Christmas Advertisements featuring various pens. This years is a simple Sheaffer pitch from probably the late teens or early 20s. The Solid Gold set would certainly be nice to find under the tree this year! To all of you who communicate with me through the year, and to those from year’s past – have a Happy Holiday Season, and a wonderful 2015.